Kids come up with the cutest things, seriously they do. As a mother of five...Yes FIVE... I've heard my fair share of mispronounced words. It never loses its cuteness and always keeps me entertained. My three year old loves polka dots or Pokie Knots as she calls them. It's too cute to even correct. I'm constantly surfing the web for new cookie ideas. 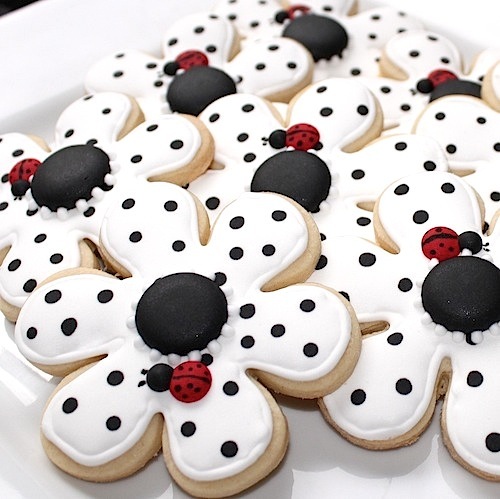 I remembered seeing some polka dot cookies with tiny ladybugs on them a few months back. I apologize in advance for my lack of memory on where I saw them, but they were the cutest things ever.......aside from my five little cookie monsters. So off to the kitchen I went to bake some flower cookies.....after all, I am trying to get mom of the year at some point. After they were finished cooling, I started the outlining process and gave them a few minutes to dry. Next came the flooding and more waiting. It seems like time stands still when you're waiting for icing to dry. My little angel was so patient...at first. Then came the question.....you know the one..... "mommy are they done yet?" After quite a bit of waiting....because you know they take quite a bit to dry completely, she finally could eat her cookies. She even shared one with her baby sister....yes, just one. I think they turned out rather cute, don't you? What a cute name! LOL I LOVE IT! Gorgeous cookies. Great technique! I bet your kids loved them! Hi! I just came across your cookies on Pinterest and I love your version of a cookie that I have in my shop =) More than the cookie, I love your daughter's name for what I call pdots!!! Such a cute story. do you bake & sell these?